After an "interesting" look for the morning events for the National Day in Monaco, Princess Charlene has chosen to wow everyone with a bicolor gown. 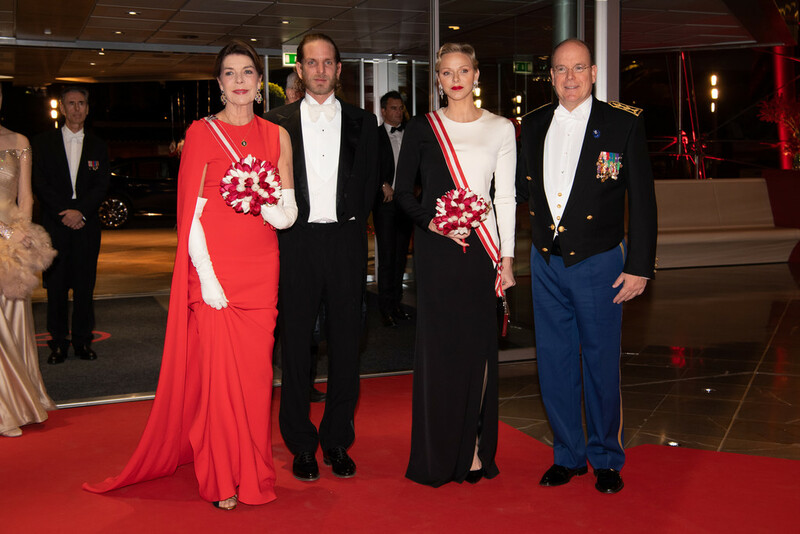 The Princess donned a Black and White silk marocain crepe colour-block gown designed for her by Albert Kriemler for Akris. 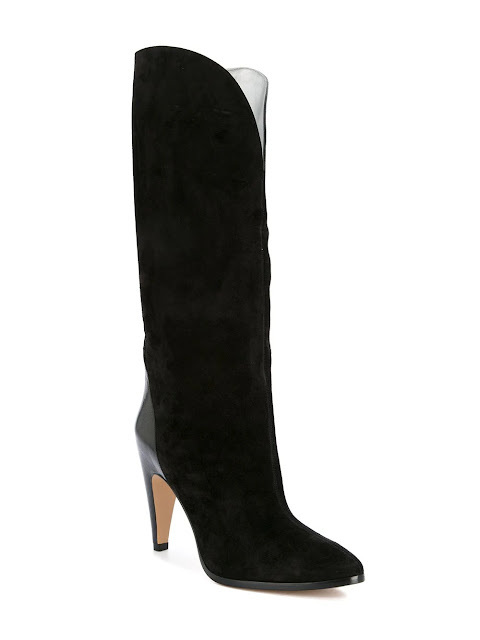 The dress features a knee-high slit that showed off the Princess's Jimmy Choo patent pumps. Unlike the past years, the Princess chose not to wear a coat or gloves. The gown is long-sleeved and is not backless like the past year's, so I suppose Charlene was warm enough in it... instead, she was on FIRE 😍! The gown also allows for a perfect placement of the order of St. Charles sash and medal. 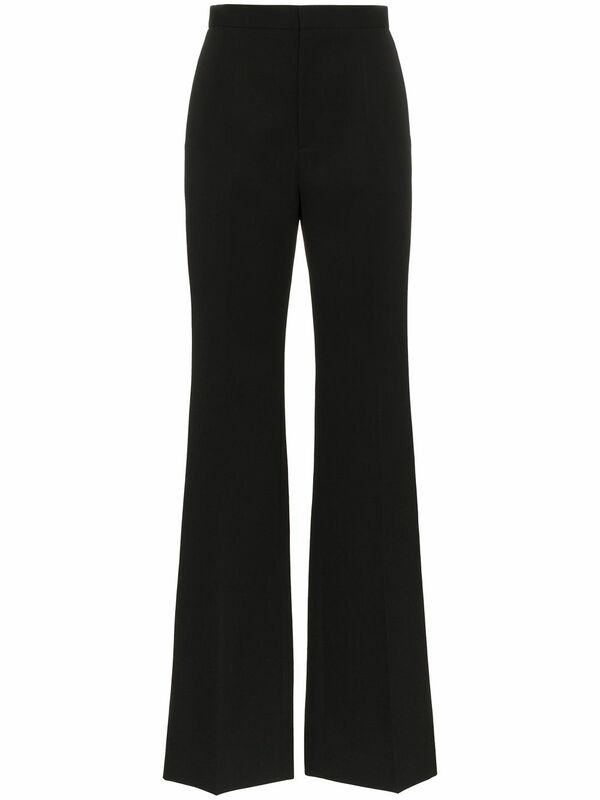 Charlene also wore new earrings by Repossi. The retro hairstyle trend Princess Charlene has been sporting lately continued and she finished off her look with glamorous makeup and a red lip. For me, this look is a total winner. 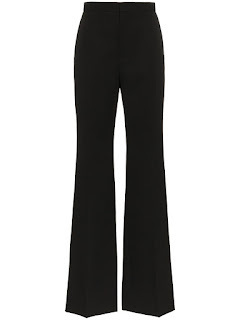 Earlier today, I asked for an outfit that's "not black" and my wish has been half granted. I was secretly afraid the off-white gown and knit coat thing that has been going on for the past few years would continue, so I'm glad that Charlene chose to surprise us while staying true to herself. She might have been out-coloured by Princess Caroline, but she looks every inch the Princess of Monaco she is and the jewelry is just fabulous. N.B: Princess Caroline was wearing a Stella McCartney cape-effect gown with Louboutin sandals. 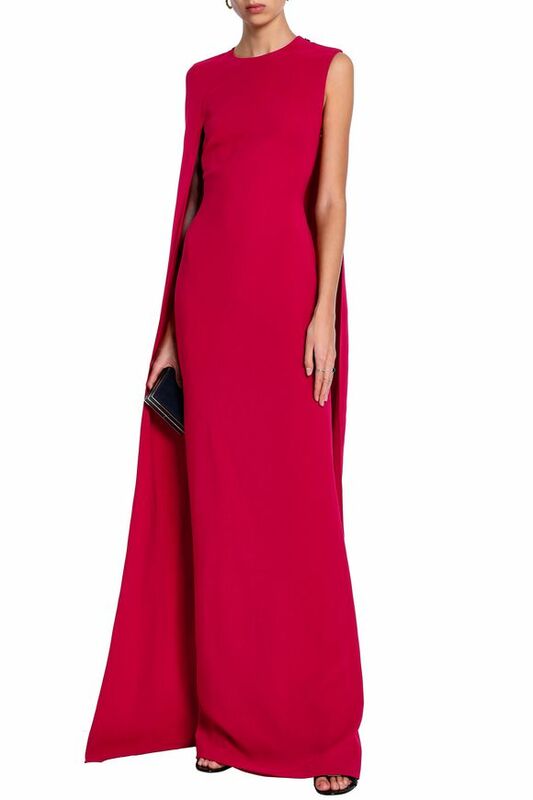 Her dress which was also worn by Queen Letizia is available on The OutNet for £ 967. 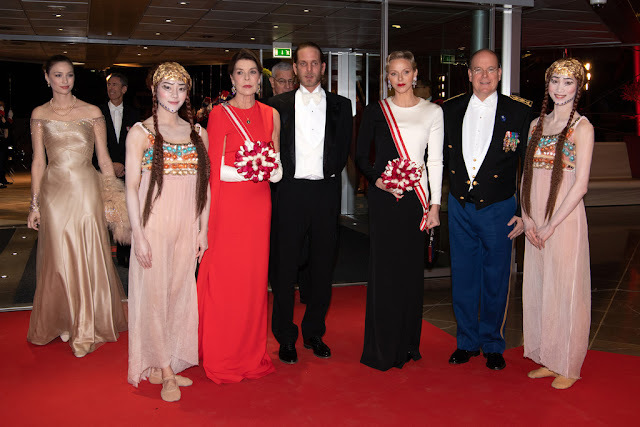 The National Day celebrations took place in Monaco today at the Palais Princier and the Cathedrale Notre-Dame-Immaculée. 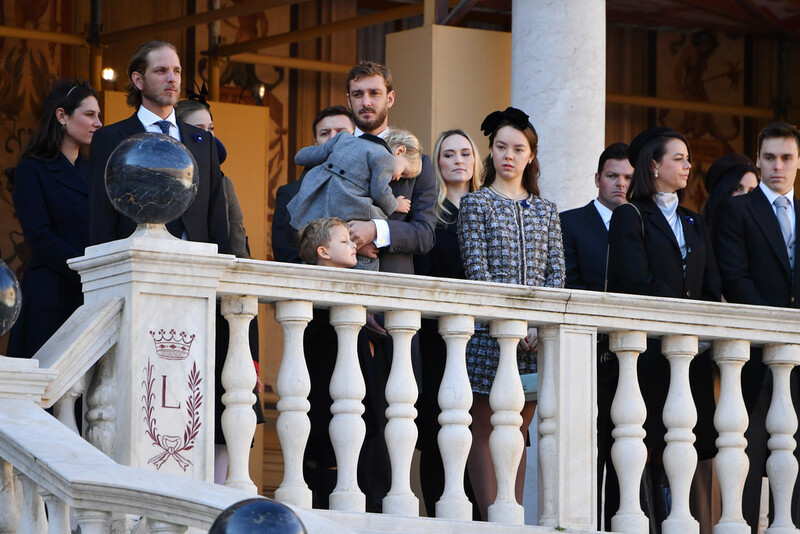 As usual, the whole Grimaldi clan (minus Charlotte Casiraghi who has given birth recently) was there in full force. Not as usual, the whole Wittstock clan (minus Mrs. Lynette) was also there in full force. 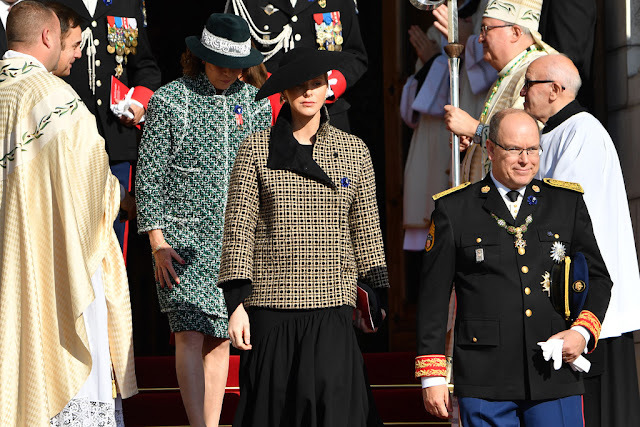 What Did Princess Charlene Wear? 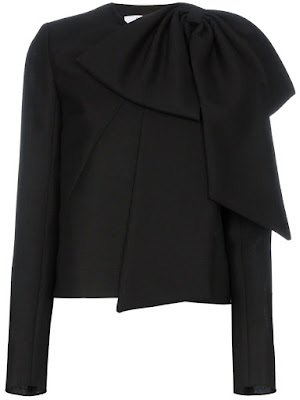 For the event, the Princess donned a Black wool crepe drop waist dress and an embroidered black and camel stand collar jacket by Akris. The custom-made ensemble was designed by Albert Kriemler for the occasion. 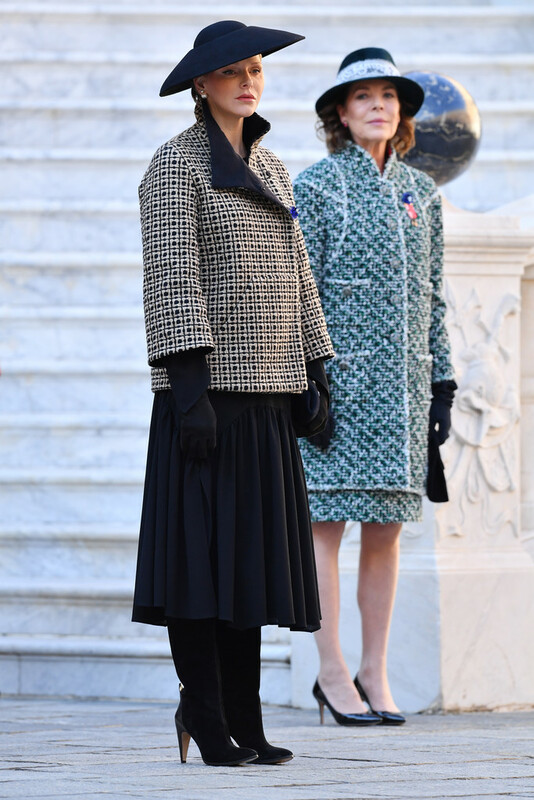 Princess Charlene paired the two-piece frock with Akris suede gloves and a wide-brimmed black felt hat by Gallia e Peter for Akris. The clutch the Princess held is a Giorgio Armani that she's had for years. It reappeared in Paris last week. La Princesse de Monaco finished off her look with her Dior Tribale earrings (also worn by Pauline Ducruet today) and Givenchy knee-high leather and suede boots. These gorgeous boots are currently 40% off for $1,287 on Farfetch. What do I think of this outfit? 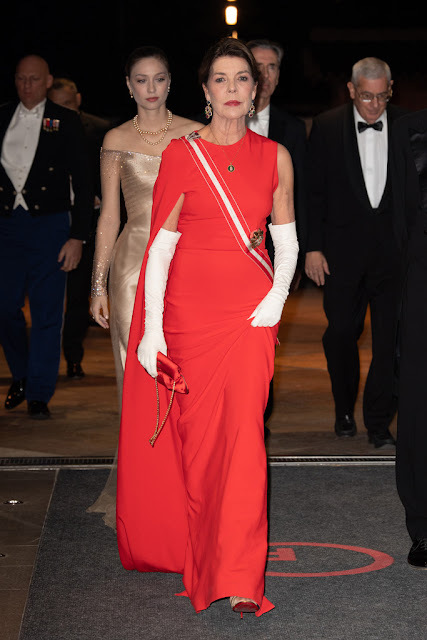 I really like the drop waist of the dress and I'm glad to see Her Serene Highness in a larger hat, but these two don't save the outfit for me. There's no doubt it's elegant, but the jacket and its fit really age Charlene. The sleeves of the dress showing under the jacket's sleeves are bothering me a lot since this outfit was designed especially for her! 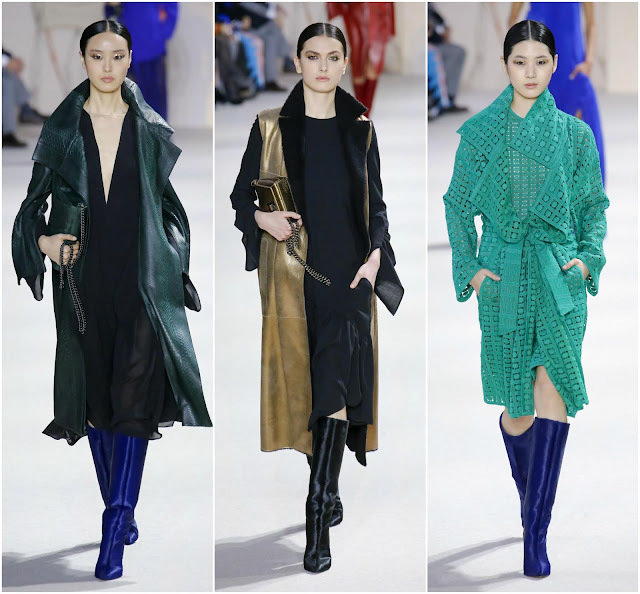 What makes me more disappointed is that there were other looks from the Akris Fall 2018 that would have made a killer base for an outfit for such an occasion. My best dressed for the day you ask? A tie! My hopes for tonight? Anything not black! Photos have been all over the internet and the press has been raving for quite a few days now. 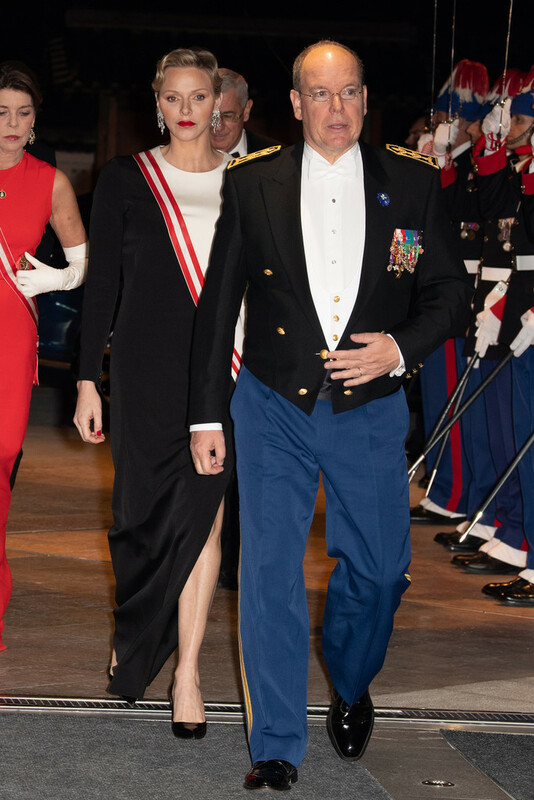 The reason is simply that Princess Charlene has looked phenomenal in her last appearance in Paris. I waited because I thought she would attend Prince Charles's birthday and we'd get two amazing appearances, but Prince Albert has attended the birthday dinner solo. In Paris however, the couple were all smiles together as they Mr. and Mrs. Macron at the Elysee. 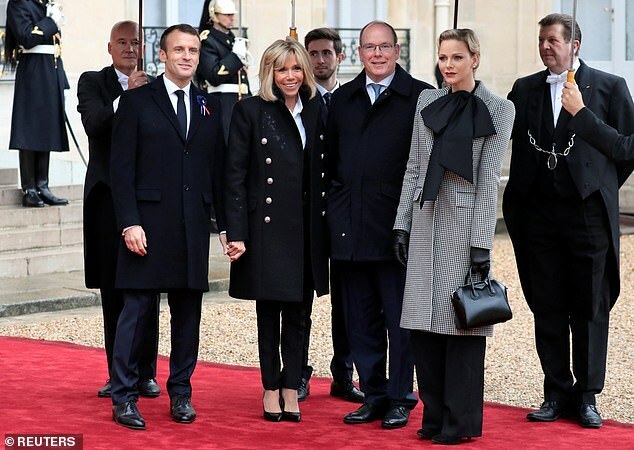 The Princess later joined Mrs. Marcon at Versailles Palace for lunch with other spouses including Melania Trump (who looked amazing in Dior). If you've been following this blog for a while, you would know that I prefer HSH in colour, but this time I'm all for the black and grey. On a day when the whole world remembers soldiers that gave up their lives, fashion should take the backseat. 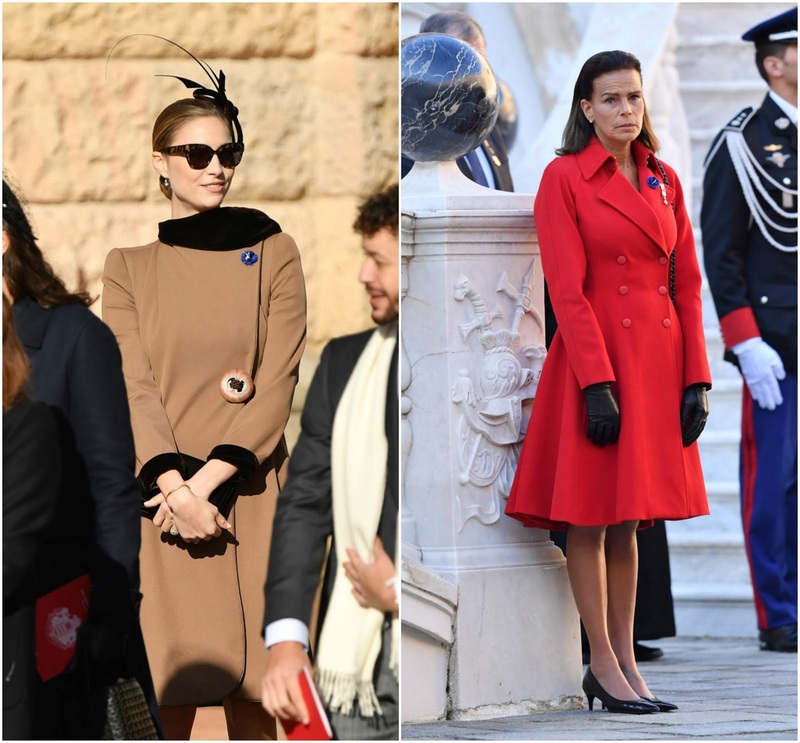 The occasion calls for a sombre look, but a princess among a group of first ladies (and first gentlemen) should also dress for her rank. 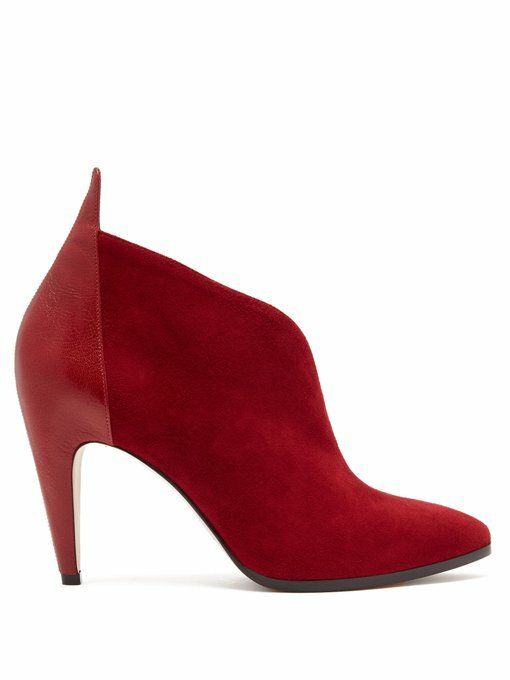 This look delivers on both ends. 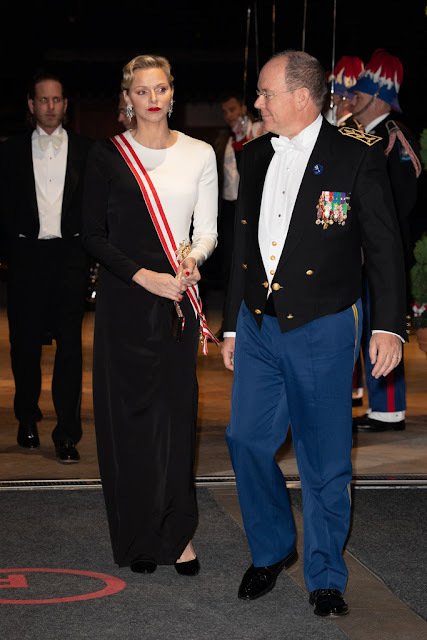 The black and grey are subdued enough while the gigantic bow and red lipstick give the flair the Princess of Monaco should have at such a gathering. We've seen a similar retro hairstyle recently at the Princess Grace Awards. Perhaps the good reviews from everyone are the reason why the Princess opted for it again this time. The makeup is perfection! 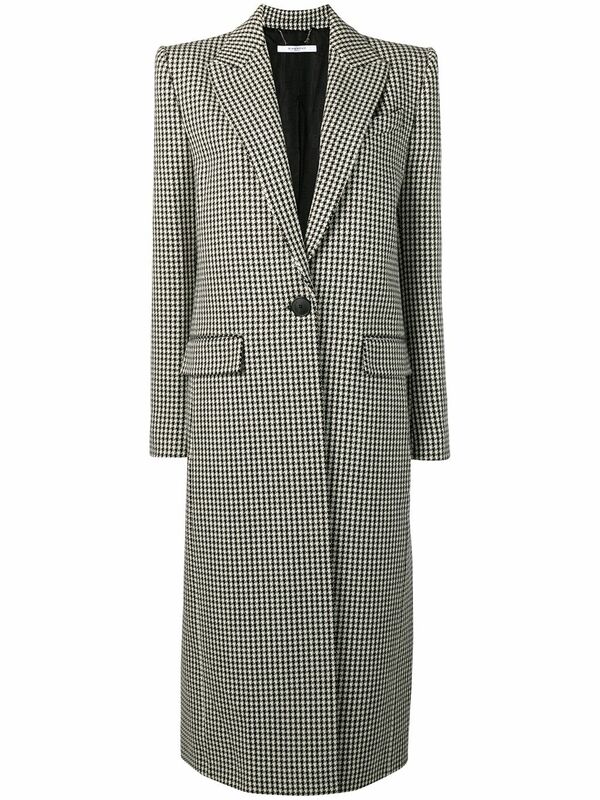 This is the first time Princess Charlene wears Givenchy, a brand that I've been hoping for her to wear for years... maybe dreams come true after all! 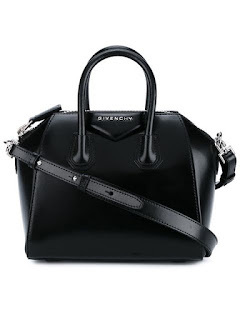 The House of Givenchy was deeply connected to the Grimaldis at a point in time. We'll look deeper into the relationship the Maison had with Princess Grace at a later time. But for now, do you love this look as much as I do?